Brief：Chinese investors stepped up their investment in overseas commercial and residential markets in the first half of 2014, with London,Chicago and San Francisco the most popular location. 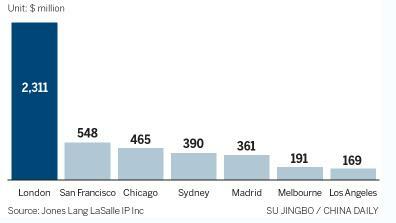 London, Chicago, San Francisco top locations for $5.4b from China. Chinese investors stepped up their investment in overseas commercial and residential markets in the first half of 2014, with London the most popular location, real estate services firm Jones Lang LaSalle IP Inc said on Wednesday. Overall Chinese outbound investment climbed to $5.4 billion in the first half, 17 percent above the same period in 2013. While commercial investment took the largest share, almost $4 billion, the real growth was in residential investment, $1.5 billion, 84 percent higher compared with last year. London proved to be the top location for Chinese investors, attracting $2.3 billion in its commercial and residential property markets, a side effect of the city encouraging more Chinese mainland capital to be put into major infrastructure projects. Institutional investors targeting London include China Construction Bank Corp, China Overseas Holdings Ltd and China Life Insurance Co Ltd, which bought core central business district office assets. San Francisco and Chicago followed behind London with $548 million and $365 million, respectively. Just as in London, CBD office assets were popular, but this time it was a private investor that snapped up the 225 Bush Street property in San Francisco. Darren Xia, director of the international capital group at JLL China, said developers and insurance companies remain the most active investors, with a notable increase in interest in hotel and hospitality products at popular Chinese tourist destinations, such as New York and Sydney. "Although the Chinese investors have been very active in the world's major cities in the first half, we are seeing them pursuing opportunities right across the spectrum of geographies and sectors," said David Green-Morgan, global capital markets research director at JLL. For inexperienced overseas investors, it makes sense to target the most liquid cities. But for more experienced ones, they are looking at smaller less-liquid markets such as Spain, where yields and risks are both higher, according to JLL. Dalian Wanda Group Corp Ltd became one of the first Chinese investors to enter the Spanish market with a purchase of an office building in Madrid from the Santander Banking Group. The introduction of the Golden Visa, where foreigners who buy real estate are granted visas, in many southern European countries, has also raised the profile of these locations amid Chinese mainland investors. The slowing real estate sector at home is one of the reasons why investors are switching to overseas markets.